A major new 15-storey mixed-use development, housing the UK headquarters of Amazon, designed internally as a 21st century warehouse, offering a more interactive and flexible model of working. towards the east, providing exceptional terrace and roof spaces for workers to enjoy. Its form and expression encapsulate the duality of its setting, at the point where the City and Shoreditch meet, with several shops and restaurants that wrap around the building at street level, creating a 360-degree active frontage that extends the vibrancy of the City towards the north. The refined materiality of metal and glass offers a unique texture to the building, with an expressed bronze structural frame that references the historic cast iron structures found in the area. Providing 85,000 square-metres of flexible premium office space, it currently houses the UK headquarters of Amazon. The primary entrance to the building opens out onto a new piazza, creating an active interface with the surrounding urban environment, and generating a place that establishes connections within the community. Internally, the building is designed as a 21st century warehouse that responds to the changing nature of the workplace, offering a more interactive and flexible model. On the east and west façades, louvred shading devices protect from the sun during the warmer months, while sealed cavity façades reduce heat gain on the top floor of the building where the glazing panels are larger. The building is naturally ventilated by highly efficient on-floor units that circulate fresh air from vents in the façade. LED panels, developed specifically for the building, provide uniform light levels across the office floors, aided by two atria that bring natural light deep into the building. 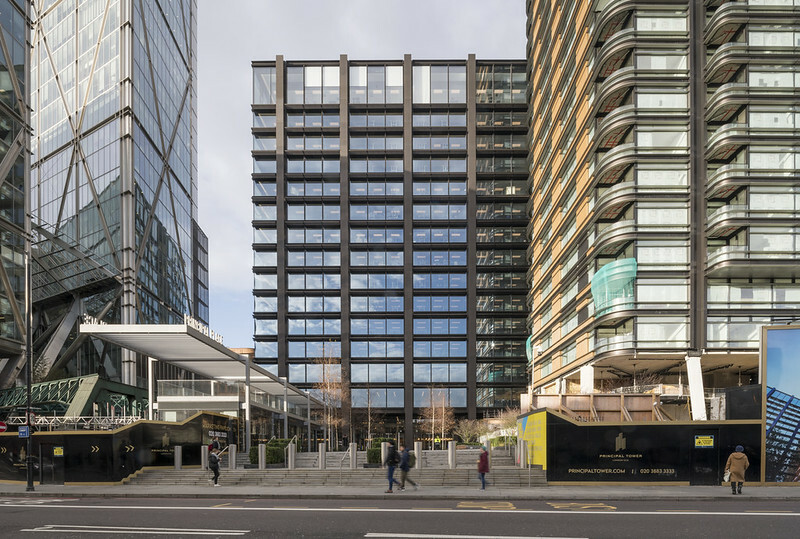 Rated as BREEAM Excellent, the building also features a landscaped terrace on level 10 and a green roof that offers dynamic outdoor areas to work and socialise with colleagues, with stunning views from St Paul?s to Canary Wharf and the City.